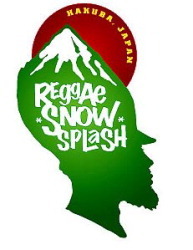 The inaugural Reggae Snowsplash is set to make waves at Hakuba, site of the 1998 Winter Olympics. The three day event from March 24-26 offers some of the top Reggae acts in Japan including Cool Wise Men, Caribbean Dandy, and Tex & the Sun Flower Seed. Take the “Babylon by Bus” package leaving Tokyo on Friday evening and arrive in Hakuba just in time for the Friday chill-out kickoff party. You can spend a great day Saturday either on the slopes snowboarding or skiing, or take a guided snowshoe hike and enjoy the beautiful nature of the Japan Alps. Reggae Snow Splash gets into top gear on Saturday evening at Tracks in Hakuba. Featuring some of the hottest reggae, ska and roots bands upstairs, and DJs spinning roots and dub in the downstairs Roots Cellar. The event promises to be one of the hottest and most fun events this ski season. Begin the weekend as soon as you get on board and party all the way up to Hakuba! Once you arrive it doesn’t stop as the Snowsplash Kickoff Party will be going full swing at Tracks. Departure: Friday, March 24 bus leaves from Shinjuku at 7 p.m. (Arriving at Hakuba at approximately 11 p.m.
Return: Sunday, March 26 bus leaves from Hakuba at 3 p.m. (Arriving at Shinjuku at approximately 7:30 p.m.
Friday Kickoff Party: Tracks Bar Free EntranceReggae Snow Splash on Sat. March 25, includes entry to Tracks Bar and Roots Cellar Club. Only 1500 yen per person! There are three accommodation packages to choose from that will suit everyone’s needs and budgets (all prices are for 2 nights, Friday & Saturday). All lodgings are within a short distance to the Tracks Bar. Note: 10,000 yen non-refundable deposit required to reserve bus/accommodation. Full payment must be received by March 10. Access / Getting ThereTracks Bar and the Roots Cellar Club, the venues for Reggae Snow Splash, are located in Hakuba, one of Japan’s premier ski areas. Hakuba is located to the west of Nagano City and is easily accessible by train, car or bus.